This entry was posted in Books, Connections, Music, Quotes and tagged abigailadams, Americanindependence, barberofseville, beaumarchais, figaro, johnadams, josephellis, learning, mozart, mylife, opera, serendipity, synchronicity, synthesis, Velcro by alivingpencil. Bookmark the permalink. 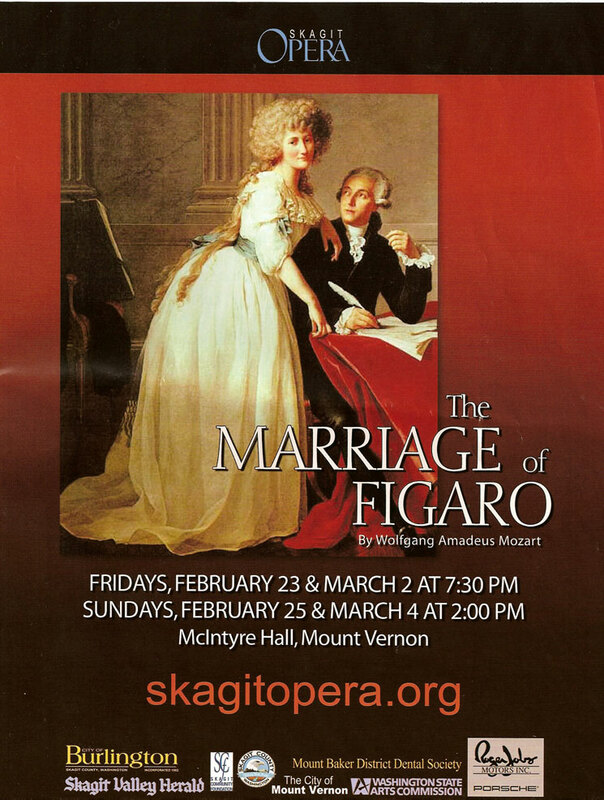 How did you come to select the Skagit Opera poster–for me, a serendipitous connection? Carol, my connection is with the Skagit Valley (not the Opera itself–I didn’t even know there was one!). My family is from there, and I attended the community college where the concert hall is now located. I believe earlier this year you posted pictures from the area, too? Yes I did! We went to the Tulip Festival. Now I want to go every year. Our son lives on the east side of Seattle, so it’s not that far. May another Skagit Valley native add raisins and chopped walnuts to the cinnamon you’ve already had sprinkled on this post? Though born in Anacortes, Barzun is the keyword that drew me to your synthesis. I enjoyed the connections you made with his Beaumarchais observations. If you feel sufficient reverberation from Youtube versions of Barber and Figaro, and decide to follow Barzun’s lead in other things, you might try “Why Opera?” or many other short pieces in A Jacques Barzun Reader. Workouts as vigorous as From Dawn to Decadence not guaranteed, but you will find pleasure there. Thank you for your kind words. Your raisins and chopped walnuts are greatly appreciated! I plan to read more Barzun when I’m done with Dawn to Decadence. Thank you for the recommendation. I’d love to read his essay on opera. My brother is a tenor with the San Francisco Opera Chorus; I have a vested interest in opera! As it happens, Carol, my name is John Adams, so serendipity’s getting rampant here, though I am not married to an Abigail. Accent for “Skagit” is on the first syllable with “a” as in apple, and the “g” is soft like a j, making it “SKA-jit” – a lovely place by any name. I have yet to attend an opera, or hear one for that matter. Following all of Barzun’s recommendations would make for a busy (and expensive) social calendar. Reading him is far more reasonable – in every sense – and valuable. If your library has access to Vogue magazine’s back issues (through the EBSCO host service, maybe? ), there is a Barzun article called “The Place and the Price of Excellence” in the February 1, 1959 issue that I highly recommend (and is not in A Jacques Barzun Reader. Wishing you frequent synchronicity. What a lovely post. I know almost nothing about opera, Barzun, or Beaumarchais, but I don know the feeing of serendipity in reading and learning that you are writing about. It’s a good experience, akin to C.S. Lewis’s concept of “joy”, a feeling that the world works together in concert.